Introduction: Our last family paddle of the year was to enter Mudro Lake via pretty, winding Picket creek where moose sightings are not uncommon. With short paddles through a lovely chain of 3 lakes and relatively short, easy-to-moderate portages, our intention was to make beautiful Horse Lake and base-camp for a couple nights before beginning the familiar autumnal grind of school, work and urban life. Day 1: August 30th The first day is really never the day that we put in. The packing starts earlier in the week with gear being pulled from every corner, food lists drawn up and gathering stove parts and kitchen utensils for the excursion. Stuff sacks are then crammed with clothes, equipment and “stuff” before loading everything into our car and driving off. On Friday, we finally left the urban environs at about midday under partly cloudy skies to head north from Minneapolis. Arriving in Ely around dinner time, we picked up our permit at VNO and headed up the Echo Trail to bed down at the lovely, secluded NFS Fenske Lake campground before nightfall. Next morning a brief spit of rain rolled through but we soldiered on with breakfast and packing. Finally around 10AM we were ready for the trek by car up the forest service gravel road which starts out as Grassy Lake road just north of Fenske. Mud and Poling. The put-in at Mudro is typically an easy affair even though Picket creek rarely has sufficient water levels to float a canoe from the parking lot. 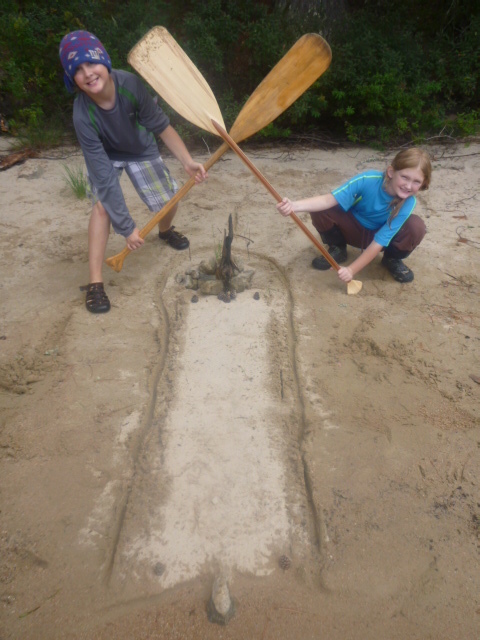 The trail is only a 26-rod flat, sand-and-dirt trail that is well used, terminating at a sandy beach on the creek. We soon encountered the typically low water levels on Picket Creek, dodging exposed rocks and then poling our way to a well-developed beaver dam and our first lift-over. Boot-sucking mud awaited our first liftover as we unloaded our boat and slipped and slid over the wall of pointed sticks, mud, and twigs. Some of us went in up to our knees! Another 20 minutes of paddling, poling and rock-dodging allowed us to reach the entrance to Mudro Lake but only after lining our boat through two sections of, rocky, necked-down stream with large exposed boulders. The beaver had done its work well–only last fall the creek entry was a piece of cake taking only about 20 minutes. This time we spent the better part of an hour navigating Picket creek before actually paddling into Mudro Lake. Finally Paddling. Despite its popularity and heavy use, Mudro Lake has become one of my favorite little lakes with high forested ridges and rocky shorelines. Running west-to-east, we made good time paddling the 20 or 30 minutes across this small lake. There was just a hint of fall colors peeking out as evidenced by the the pale yellow birch and a red maple or two dotting shorelines. 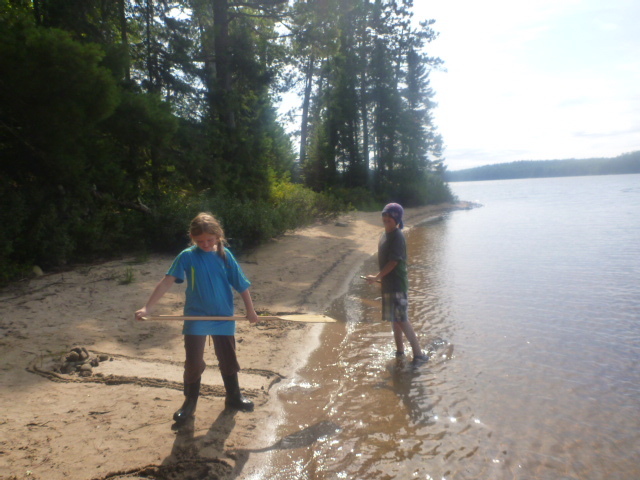 We landed and unloaded at the east-end of the lake to cross the 85-rod portage, our first of the day. This portage starts out fairly smooth and flat for the first 10 rods or so, then climbs gently to a flat trail that then descends steeply over a rocky, slippery trail for remaining 50 or 60 rods finally dropping down about 65 feet in elevation to the finger-like Sandpit Lake. This lake offers a bifurcating route option at the east-end of the lake. 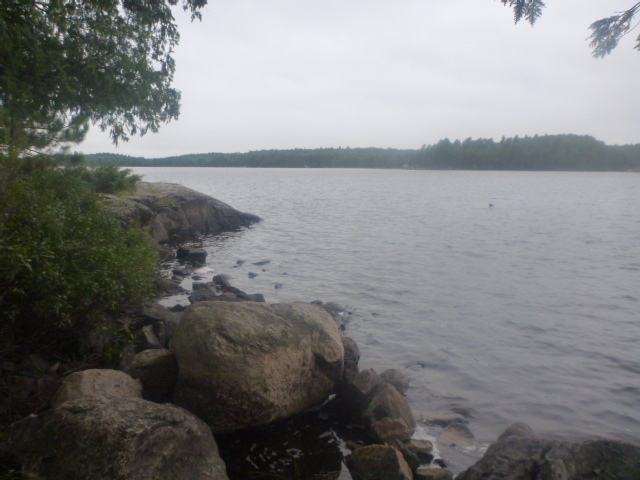 A southeastern exit will take you down a constricted stream and two short portages to Jackfish Bay of expansive Basswood lake. 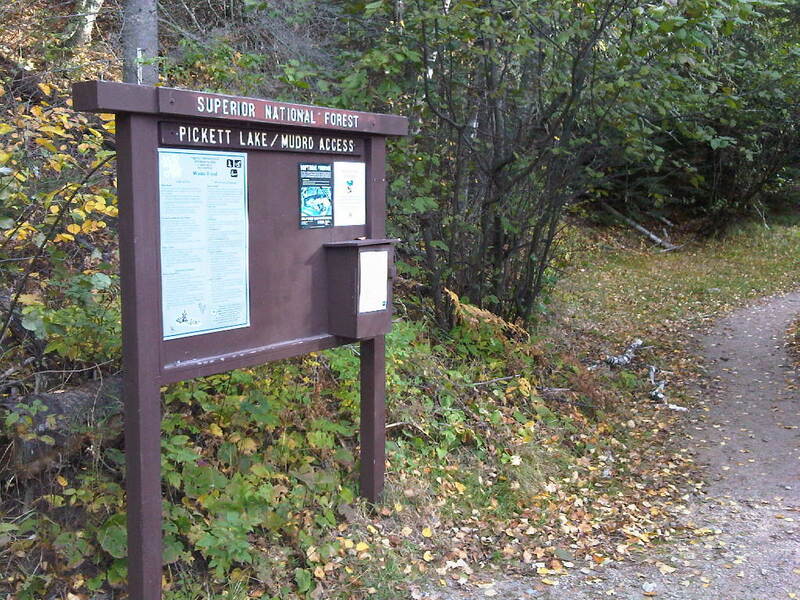 Our route was the northeastern trail consisting of a 160-rod trail to Tin Can Mike Lake. This flat trail is a former rail line, a vestige of the old logging area. With it’s flat, relatively dry walk, the trail ends in a nicely constructed boardwalk for the final 20 or 30 rods that delivers you to a smooth rock outcropping and a sandy put-in. 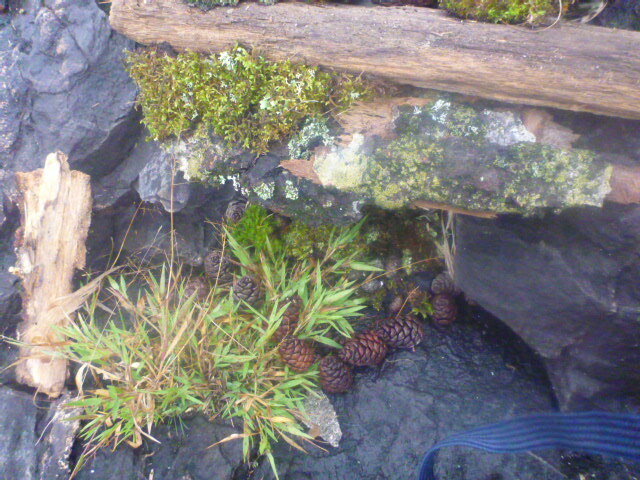 The portage into Tin Can is quite possibly the easiest 1/2 mile portage I’ve ever walked. Our route then swung north on Tin Can Mike, the third pretty lake in the chain that leads to Horse Lake. 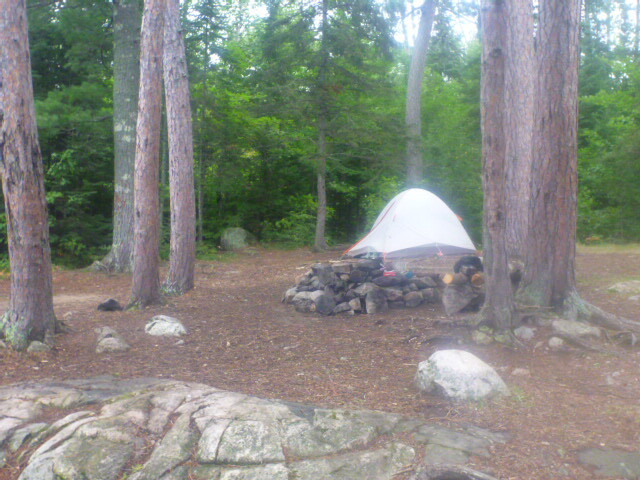 Two families were already encamped as we paddled by, one on the west shore on a rocky outcropping in what looked like a wonderful site and the other on the eastern shoreline, nestled in the woods. At the northern end of the lake, we located our last portage of the day, a gently-rising and then descending 90-rod entry into picturesque Horse. Setting Camp.Our little ones chose our campsite by the Horse River which may have been the first time they have ever opted to paddle farther in search of a base-camp than their parents! We were not disappointed by their choice! We finished the day setting up camp, preparing dinner, erecting our tent and tarp and hanging our food bags with our new 3-pulley system. creatures to enchant our surroundings. My last hours of dusk and twilight were spent trying out the fishing in front of the campsite although small walleye were all I was rewarded with (and a few lost jigs!). Casting in the dark is a skill I have yet to master but the water was still, the moon was on the rise, and my wife Thea was playing cribbage with our kids which I had just taught them before the trip. I reveled in the perfection of the evening as I packed up my gear in the dark and headed for our tent. 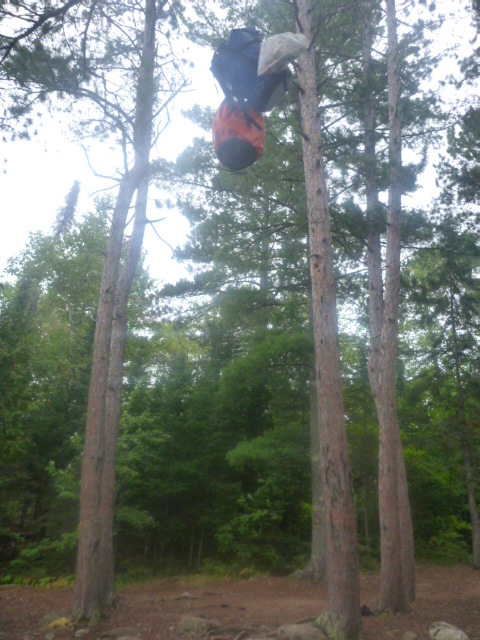 Day 2 Highlights: At 4:38 AM the next morning, in the gray of early twilight, I was awakened in the tent by something that I haven’t heard since we all camped together on Lost Bay Island in Voyageur National Park. A wolf pack was howling in perfect call-and-answer in the woods very near our site. They were at once close and far away apparently relocating each other after the night’s hunt in our vicinity of the Horse River. I woke my wife Thea but couldn’t rouse either my son Ethan or daughter Leah who were both sound asleep. We listened breathlessly though for 5 to 10 minutes before it faded. I awoke again about 30 or 40 minutes later to hear a repeat performance by the pack, yipping and yelping as though chasing each other through the forests. Awe-inspiring was the only word that aptly described the experience. Early Morning Fishing. This was sufficient motivation to string up my lines, grab the boat at 6 AM and slip out in the canoe while the waters were still calm and the morning early. I had read a fair amount of fishing reports and knew the lake contours fairly well so I considered a route up the eastern shoreline trolling hard plastics as search lures in about 10 to 15 feet of water. Walleyes had been holding in shallower waters in most lakes that I had been on this summer and I took a chance that it would still be the case. Northern Horse was quiet and cool and I paddled slowly enjoying the moment. 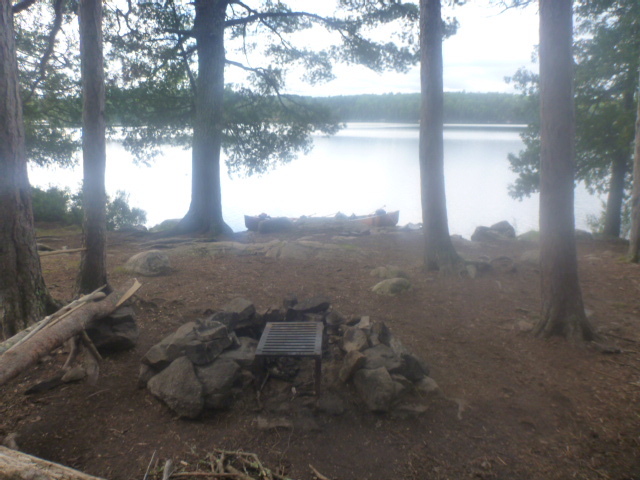 At the far northern end I found the island campsite and the shoreline site directly across, occupied by one group. I made a lazy circuit behind the island and headed south back home empty handed to this point. Rounding the island my line of my deep crankbait went tight and I eventually landed a 25 1/2 inch pike. Paddling a bit further around the island heading again for the eastern shoreline I reeled in a small walleye that was probably around 6-8 inches. I released him to grow bigger for next year and paddled happily home, assured of fillets for dinner that evening! Arriving back in camp, my family was slowly stirring. We dropped the food bags from their perch and prepped a huge feast of bacon, eggs, cheese and wrapped tortillas. A 1.5 Litter carafe of coffee hit the spot for the adults and we began planning our day’s excursion before the winds could come up. Beached. Two hours later we were finally on the water paddling back south past the Horse River to the peninsula beach site that had been decommissioned some time ago by the USFS. It was a lovely spot and lunched, our little ones played in the sand and we explored the “island” as the spot had that secluded feeling that the place was all to our own. With the wind picking up a bit and needed to reload our water bladders for filtering, Thea and I decided to head straight across the lake to the western shore where a deep 30 foot hole was supposed to exist and the promise of some good jigging. As we paddled across my deep diver hardbait went taught. I tried to reel in but a good wind gust hit us and we swung broadside to the waves and nearly tipped! Abandoning the potential catch we paddled furiously for the leeward side of an island and sanctity. Dark and grey clouds were now building around the lake particularly from the south. Time to head back to pick up our kids, pack and head back to camp. Rain was likely on the way. We capped the evening with a bit of topwater fishing in the bay south of our site. Leah was getting quite proficient with a 3 inch bullfrog popper when…a large strike hit her lure! …But the fish disappeared into the depths and we ran out time to coax it back before night fell. Time to brush teeth. Read a story. Lights out. Tomorrow would be packing-n-moving day. Day 3: Pack-Up and travel day in the rain and sunshine. Early morning meant a quick round of coffee for the adults, pop-tarts and pancakes topped with maple syrup. My own concoction was a pancake with crushed walnuts, yoghurt, raisins and chopped apples. A feast! Packing quickly in our family means getting away in 2 hours. We made our estimate, pushing away under a misty, grey sky heading south. 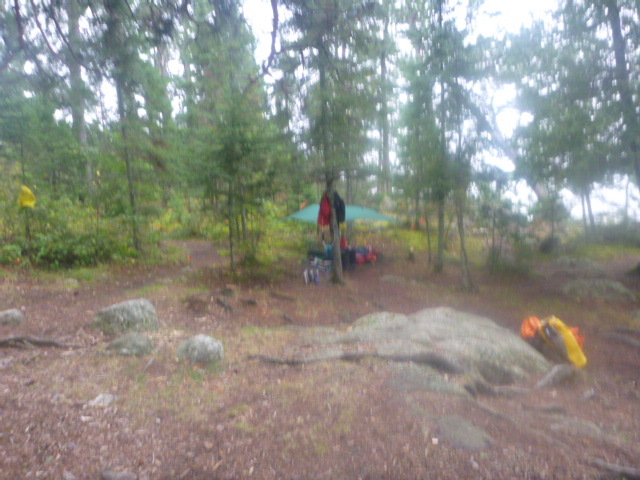 Sheets of light rain greeted our arrival back at the first portage from Horse into Tin Can Mike. The 90-rod trudge was fairly easy and sunshine greeted us on the other side. A quick put-in and we were greeted by a flotilla of 6 canoes heading in our direction. Dodging the “newcomers” we made for the southern end of the lake and our flat, 160-rodder. 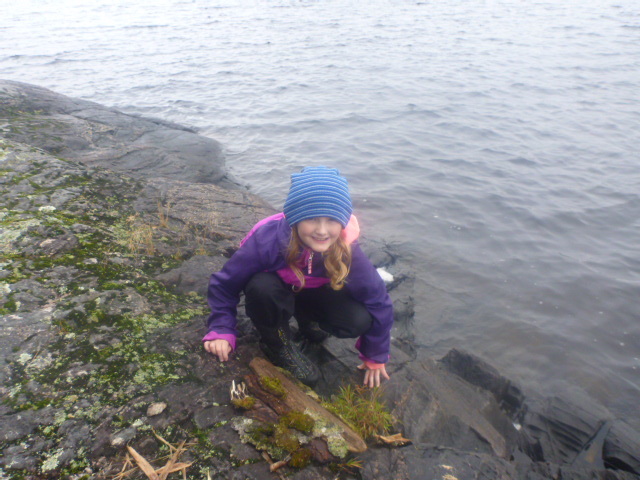 A trio of loons guided us and my daughter perfected her loon calls….and answers :). At the end of the next portage, another tandem of gentlemen greeted us as they were heading into Basswood Falls for a week-long adventure. Exchanging news in the time-honored fashion, we loaded and shoved off paddling vigorously for our final test, the 85-rod uphill climb that would lead us to Mudro and home! Last Portage. That last portage is muddy on this side of Sandpit and the climb back up the hill is a thigh-burner but we made it with energy to spare…and were greeted by….yes….another group of 4 paddlers making for Horse. It’s definitely time to go home! We paused once on Mudro, gliding silently as we pointed out to the kids to “snapshot” this lake into their memories for retrieval during the upcoming long winter nights. Then, with heavy sighs, we paddled into Picket creek to do battle with the rocks, the poling through swamp grass and low water ( I had to get out to lighten the canoe at one point) and then the heave ho over the new beaver dam construction. A few more minutes of struggle afterwards and we landed on the beach at the take-out, exhausted but glad to be back. A quick pack-up of the car and loading of the canoe was needed as the heavens opened again on us before we began the long return journey home. Pausing briefly at the intersection of the Echo Trail and Grassy Lake Rd. we inhaled the stillness one last time, then turned and headed south. Heading home.